Muriatic acid is a solution of hydrochloric acid and is highly corrosive. It can be used to clean clogged drains because the acid reacts chemically with the substances that cause clogging and release heat. Muriatic acid should be used only when less powerful methods are ineffective. 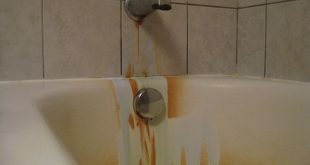 Although the muriatic acid is effective, you should always use it with care and caution and you should pay attention to all manufacturer’s instructions and warning labels to avoid injury. 1. Open the windows and use a fan, if possible, to maintain good air circulation in the room where you want to apply the acid. 2. Slowly and carefully pour 1/2 cup of muriatic acid in the drain. Let it stand for about 10 minutes. 3. Test your soil very slowly pouring water on it. If drainage is not clear, repeat the process, adding muriatic acid as necessary (up to a quarter). 4. Clean thoroughly and carefully. Rinse empty containers and follow the instructions to throw them away safely. 5. Store the muriatic acid in a tightly closed, childproof container. Store in a ventilated area and make sure the warning label with dangerous substance container is visible.